…Especially with a cup in hand of richly dark French Roast coffee…walking the garden this morning reminded me of how much I love the work and effort put into making such a special place. Here I can wander and remember…The old coffee pot picked up in Provence, the fragrant roses rooted from an old bush in Texas, blackberries growing wildly about the chicken yard, the stone plaque over the graves of beloved Border Collies, Bear & Dougal, the bags of river rock we dragged to the back and the fig tree Carl helped me plant the spring before he died…how can one not even…? Vintage Style…a passion for pieces from the past. So many stories they/it could tell…Just imagine a story you could write about the wine or whiskey once stored in this rain barrel, and the watering cans…who carried them and where was the garden…? 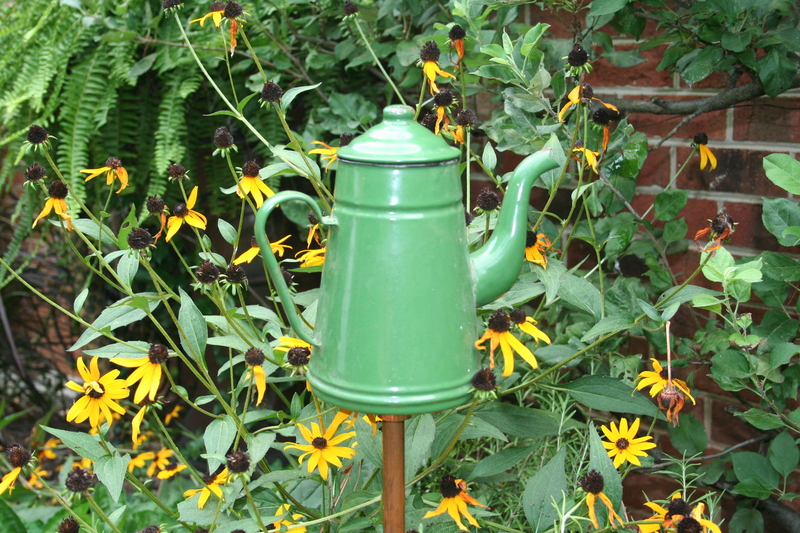 This is how my mind works as I find and later place vintage objects in my garden…and home! 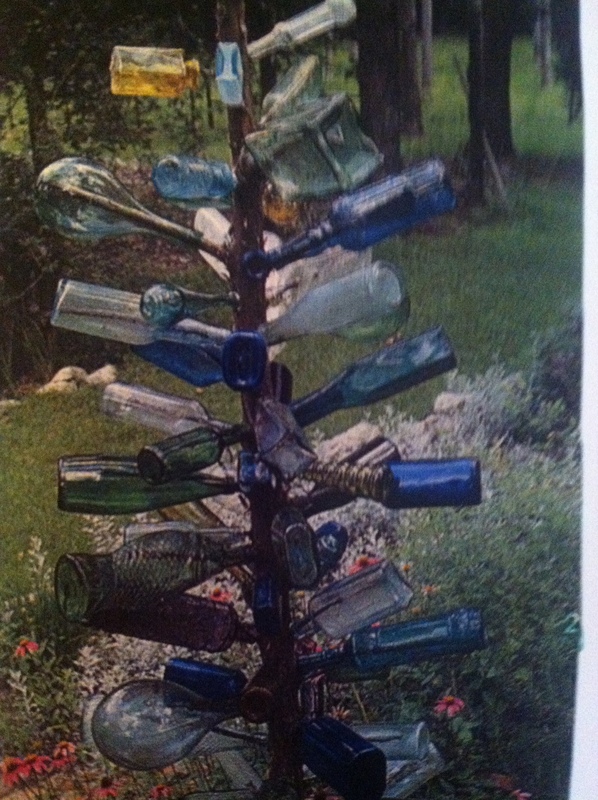 The antique French wine bottle dryer holds a collection of various bottles that stands as my Bottle Tree in the garden…why? To protect from those”evil spirits”…bad bugs and such, of course. I do really love the shapes and colors the bottle tree adds and on just the right occasion…a few sounds emanate…usually a whistling…at dark it is a bit disconcerting, but Holly is with me as my protector! 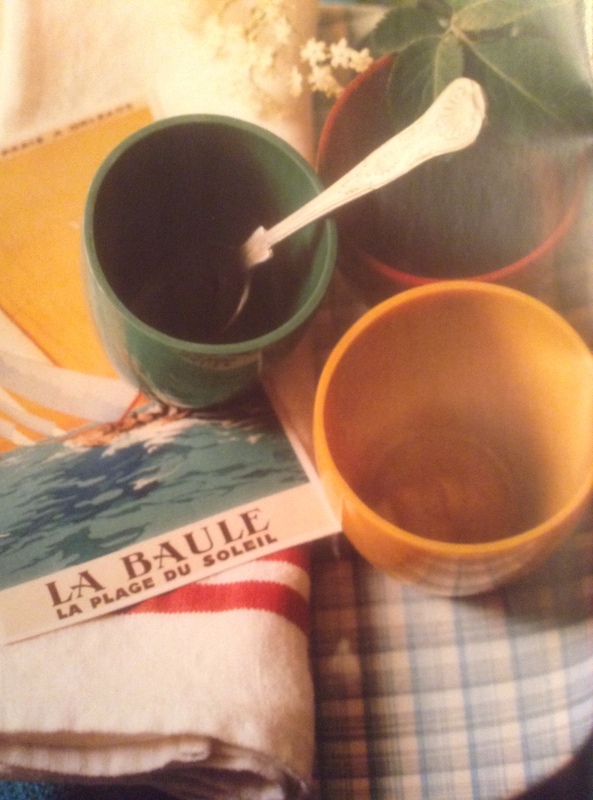 Still…an abundance of color…rustic simplicity provides an appealing array of vintage finds. The colors of FALL are among my favorites…glowing golden ocher-yellow, leafy grey-green, rustic red, vivid purple-wine, and even a bit of French blue check thrown into the mix when appropriate. Spirited and mellow tones combine to provide warmth and richness to any setting…table or garden. 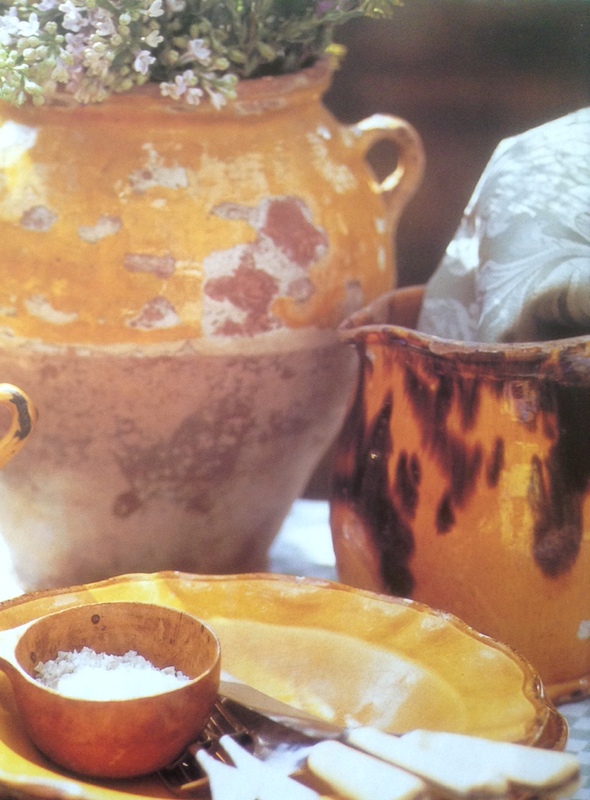 Antique pate’ jars, pitchers glazed in ocher and brown drizzle, fluted edge mustard plates for creamy white goat cheese and fresh figs…I am, and have always been, drawn to the shapes, colors and textures that reflect the spirit of the season I love, not to mention the Mediterranean region of origin. For me, the choice of food I cook at this time is very much governed by the fall season and what is best at the market that day or ready to be picked in the garden…the food is always robust, fresh, colorful and earthy, beautiful to look at and extremely healthy and delicious to eat…acorn and butternut squash, pumpkins, salad greens, heirloom tomatoes, eggplant, grapes, figs, apples, pears, and so much more. Naturally with all the “talk” of healthy food…one must turn to something sweet…CHOCOLAT, seductive and yet soothing. But for me it’s only real dark chocolate, organic and with very little sugar…surely! The taste and complex aromas of chocolate hold a special place in the heart of any dessert or celebration. After dinner with coffee is perfect for a special chocolate bite, dainty bit made with flair and such elegance…! Chocolate combines well with a huge range of different flavors…orange, cinnamon, vanilla, ginger, chilies, cardamon, black pepper & sea salt, mint and coffee. There’s chocolate mousse, pot du creme, tart au chocolat, chocolat macarons…so done, drooling now and headed to the pantry to see what I can quickly whip up for a taste of chocolat after my dinner! Better yet, no dinner, just some greens, wine and straight to dessert…depends on how much time it takes to pick the greens…then I have to rinse them and make a vinaigrette…so maybe?? I’ll have my “just desserts”…oh couldn’t stop myself! You’ll need 6 ounces dark organic chocolate, chopped, like Green & Black…melt this in a bowl over bubbling water. Let cool a bit. Meanwhile, beat a pint of COLD, organic heavy cream, in a bowl sitting in ice, until it forms soft peaks. Set aside. Then, whip 3 large egg whites, organic eggs, naturally, with 1 ounce of sugar added gradually, until soft peaks form…somewhat firm. Using a WHISK, fold in the egg whites all at once…when all gently incorporated, fold in the cream. Cover mousse and chill for an hour. I think a bit of orange zest mixed into some whipped cream makes a nice topping for serving the mousse…or, just dollop on top of the bowl, find a spoon and dip into the mousse. Holly has been in the kitchen watching me…since she can’t have chocolate, I make her a special ground turkey and raw spinach dinner! Soon, Love, be patient…all good things take time.